If you were reading during my Kona build up you may remember I attempted to plan my taper using some tables pulled from Training Peaks WKO+. The idea was simple. Look at performance metrics leading into previous races and correlate to race performance. If I raced well there’s a good chance I tapered well too. Before you start anticipating a series of tables you should remember tapering is a period allowing a lot of introspection. For the obsessive athlete you scrutinise the past few months of work to glean signs of race readiness. Surely there must be something in the last two months that clearly shows I’ll have my best race ever? That time I pulled my six hour ride short doesn’t mean I’ll have a terrible bike? I’ve not sat on my laurels. The problem with those tables is they only consider four points in time leading up to race day. Twenty-eight days summarised in four rows. The potential to hide a whole world of sin is massive! I fired up Excel, pulled the numbers out of WKO+, formulated some new tables and best of all plotted new graphs. So no tables, instead charts! I’m keeping things simple by considering six races – Australia, Roth, UK, Hawaii, Western Australia and New Zealand. That gives me four races that went well, one that went badly (Australia) and of course the predictions for New Zealand. I dropped Lanzarote as performance there didn’t relate to fitness or taper. I considered dropping the UK as its taper was so unusual given it’s proximity to Roth. For Taupo the curves are generated based on my taper plan. 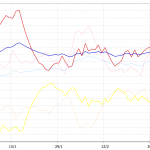 In terms of run fitness (CTL) the start of 2010 saw me at a relatively low level. 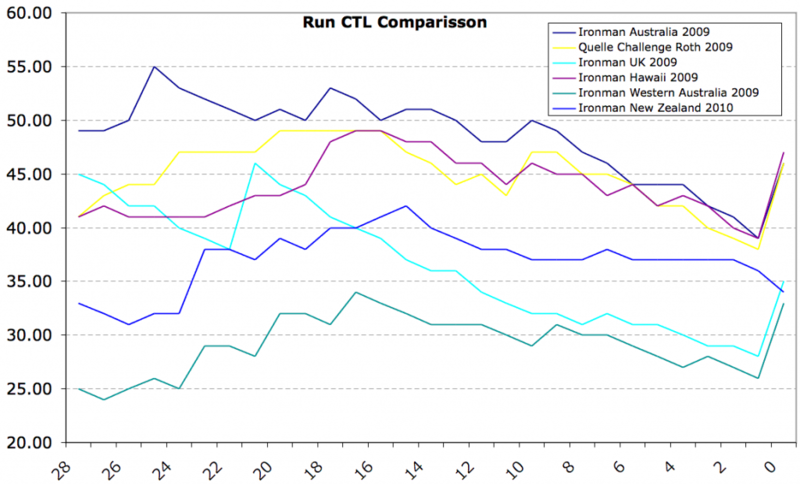 After Kona run training dropped off and there was some decline in absolute levels. Since the year began I’ve worked on restoring them and as the chart shows this places New Zealand up near Roth and Hawaii. It’s worth noting how high my CTL for Australia was. Despite apparently high levels of fitness I had an atrocious run there. Similarly UK and Western Australia have low values and my performances were much better. One message throughout is these numbers only tell part of the story! If that weren’t the case we could all submit our training data to race referees and save ourselves ten hours of hard work! 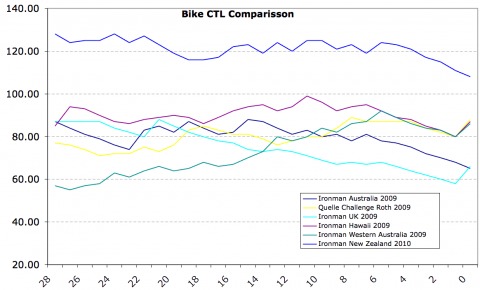 Note the relatively flat CTL for Taupo compared to the other races, this is particularly relevant in light of the other charts. Positive form (TSB) is needed for racing, though finding the exact value is an art. Based on race performance Roth, UK and Hawaii would rate the highest. It suggests a race day TSB around 15. Australia had a TSB over 20 and was a horrible day all round. Possibly I’d let run fitness slip too much and my TSB rise too high. 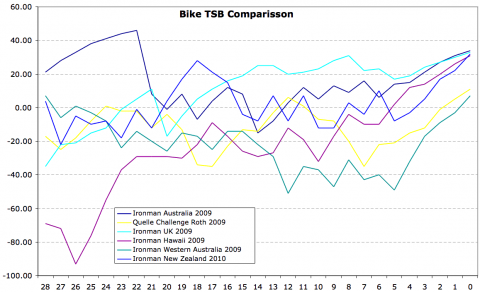 New Zealand will have the lowest TSB I’ve ever entered a race with. It’s gong to be interesting seeing how it pans out. The problem is to raise the TSB into the teens I’d need to let fitness slip to lower level. I’ll be honest I’m not sure which is the smarter move here? Part of the problem was created by a sustained period of negative TSB as I built up my running. 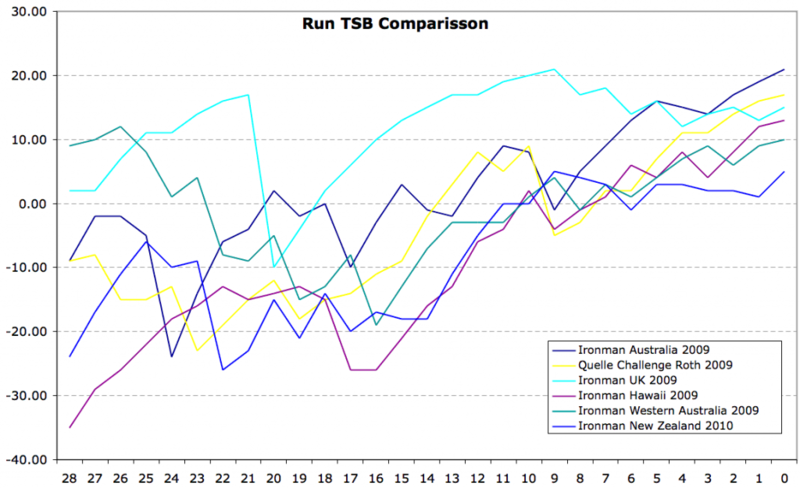 Notice that for Roth, UK and Hawaii I move into positive TSB about a week out from the race and it gradually increases. With Taupo run fatigue pulled me out of negative TSB almost a fortnight before race day. Since then it’s been a matter of balancing run training against taking too much of a hit to TSB. There’s a lesson to be learnt here which I’ll come back to another time. So the option I’ve chosen is to sustain a very easy level of training to minimise loses in fitness whilst allowing TSB to stabilise and grow a little. I’ve room to experiment at Taupo so we’ll see how a low TSB value effects my run. 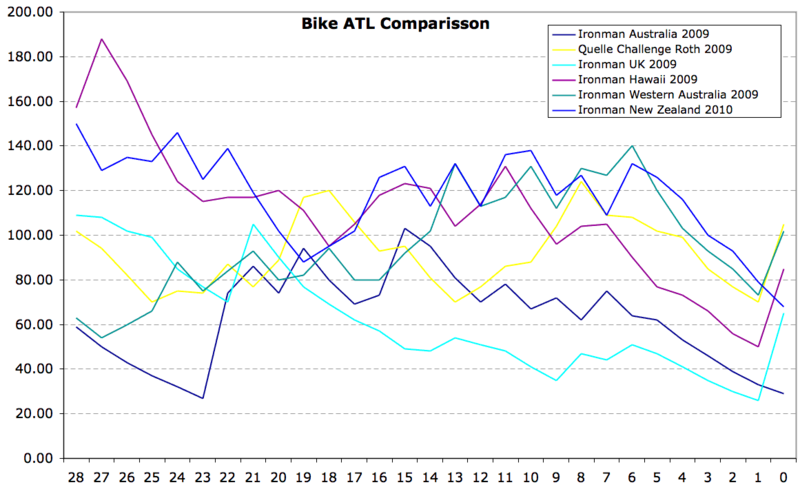 Not entirely surprisingly I’ll have the highest fatigue (ATL) I’ve had for a race too. Again the consequence of a short period of big run training spiking up my run ATL. Look at Hawaii or Roth to see a much smoother descent in ATL. Taupo actually sees a very slight growth over the final week as I try to minimise fitness loss. What’s interesting here is in appearance it looks like I managed the ATL loss for Australia well. The shape of the curve is very similar to Hawaii and Roth. 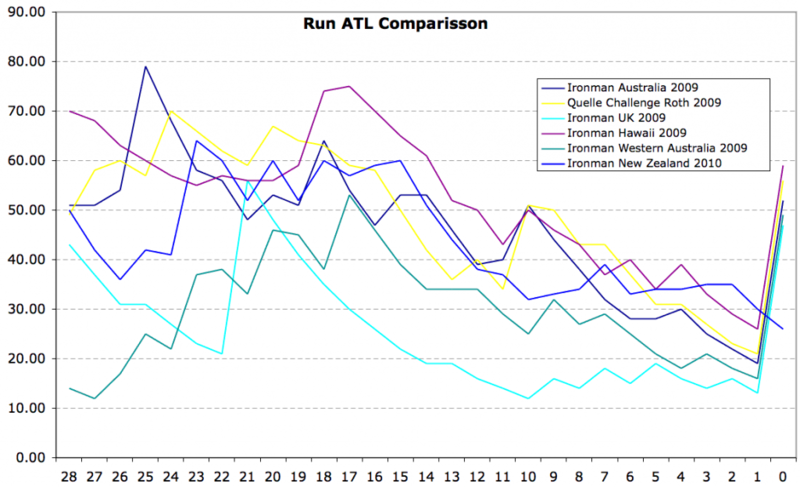 The pattern for good running seems to be reduce ATL gradually over the final fortnight. Effectively a two week taper. In fact if I were to pick a turning point it’s around 17 to 18 days out from the race. From the bump in that final fortnight a longer or more intensive run about ten days out also seems to be an acceptable part of the plan. In fact comparing Taupo’s line I’d say it’s the absence of this session ten days out that does the most harm. In order to stop a large CTL drop off I’m forced to maintain a level of ATL and that also results in the slow recovery of TSB. If only I’d done this analysis a couple of weeks ago! For future reference the plan is to build up running fitness until a final long run at eighteen days out. From there I’ll lower the daily training load with the exception of a final decent run ten days out. This should hopefully give me a gradual decline of CTL and a better rise in TSB. Fitness on the bike doesn’t seem to reveal as much. Obviously my CTL is way higher this time thanks to Epic Camp! Otherwise the general trend is quite a flat fitness profile in the final month. If anything a very gradual increase till about a week to a fortnight out then a gradual drop off in CTL. Worth noting is that for both Roth and Busselton I chose to taper the bike for a single week. I also had pretty good races! Perhaps I only need a short taper. Lowering CTL from two weeks out seems to be the longest I’ve done. 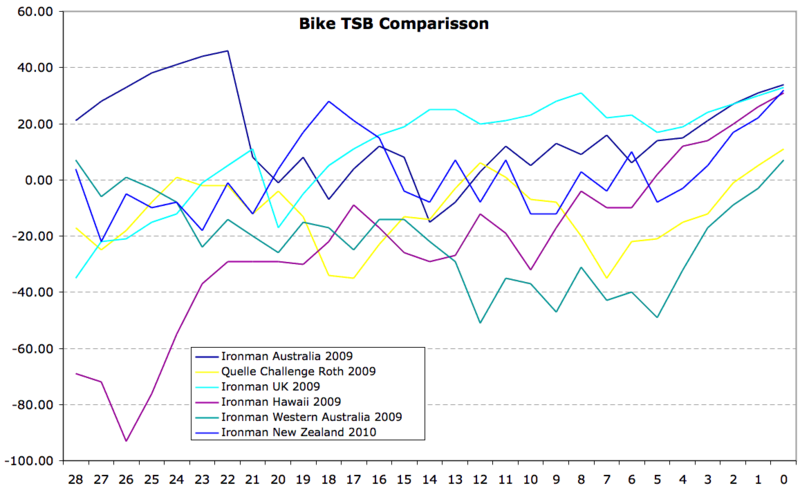 To an extent Taupo is following a similar pattern to Kona – two weeks out holding steady then dropping in the final week. The TSB chart is more interesting. Notice how much my Taupo line fluctuates. At the moment I’m not riding every day, tending to have a day of hard riding followed by easier days. It’s also impossible to draw any conclusion about race day TSB. The spread for good races is wide. For Roth and Busselton I had much lower TSB values. I’ll admit I felt tired on the bike in Roth, but less so in Busselton. Kona is remarkably high and at the moment Taupo looks like it’ll be matching it. Is that a good sign? It’s also close to the less successful Ironman Australia. 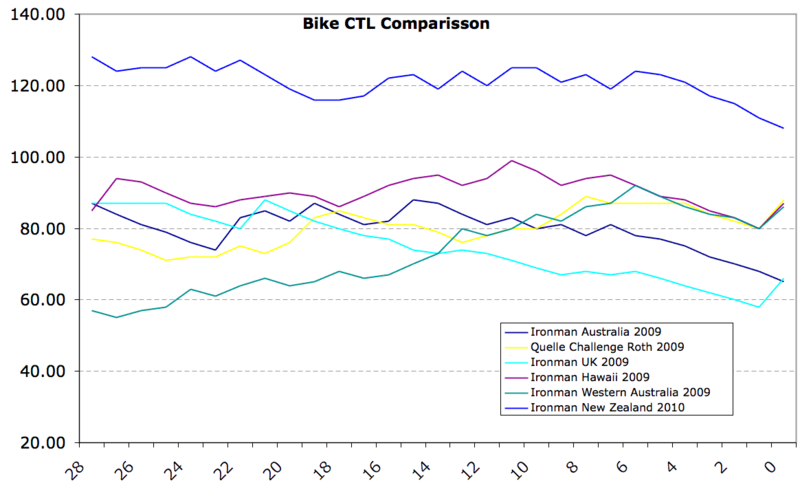 I will note that in both Hawaii and Australia I came good on the latter half of the bike. Taupo is lying somewhere in middle ground. Not the highest, but far from the lowest. I think I’m going to have to wait till race day to judge the wisdom of this. If I had any concern it’s that copying Busselton and having a long ride six days out may not be the best move. That said I’d probably only move it forward a day. Well I’m leading into this race with the highest level of fatigue anyway. 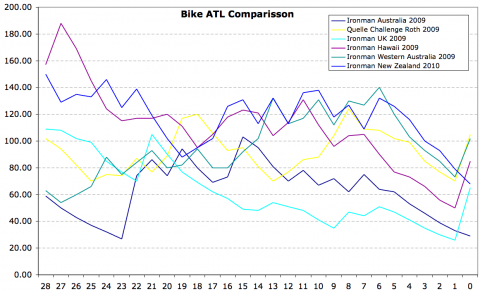 There’s going to be a bit more biking in the last week than for previous races. The reason is to minimise a rapid CTL drop and to stop the TSB shooting up to exceptionally high levels. Partly this is a consequence of the high level of CTL I’ve been sustaining since Epic Camp. This chart supports my view that I need the final big spike around seven days out from the race. Clearly in Western Australia having it six days out did no harm so hopefully the same will prove true here. That said I think I’d have been better to have focussed on riding today instead of tomorrow! 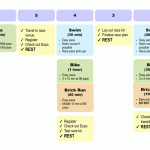 Again for future reference the plan for cycling is to finish any build a fortnight out. Rather than tapering off I will look to maintain cycling fitness for that next week, finishing with a big ride. Finally I’ll taper quite hard in the final seven days. It’s very roughly what I’m doing, but I can be a little more precise next time. Just as I said last time it’s all very well looking at this data, but it only tells so much. Race performance comes down to a multitude of factors. Good race preparation isn’t just about the rest and recovery. My gut feel for Taupo is that I should be stronger on the bike than I have been and should be able to post a good bike split. I’m a little uncertain about the run. I feel better prepared than in Busselton which is good, but I don’t think I’m at my best run form yet. The swim? Well I’ve been in the pool loads and it’s paying off. There are definite improvements over the past month. By all rights I should be able to comfortable get the swim done in an hour. If I don’t then I clearly haven’t executed to the best of my ability. I should also come out of the water feeling a lot fresher than usual. A short swim involves at least 4km these days! I’ve every opportunity to have a great day in Taupo. The biggest risk is that I’m more fatigued than I’m allowing for. Certainly recovery and rest have at times fallen short. I’ve also worked hard to sustain quite a high training load throughout February and to get myself to race weight. A tough combination to maintain! We shall see in a week’s time. Then come Lanzarote I can pull these graphs out again and wonder what to do!